It’s amazing what we can do if we’re determined and dedicated. We CAN do what we think is impossible. Running marathon number five and seeing what I’ve accomplished so far is a testament to that. 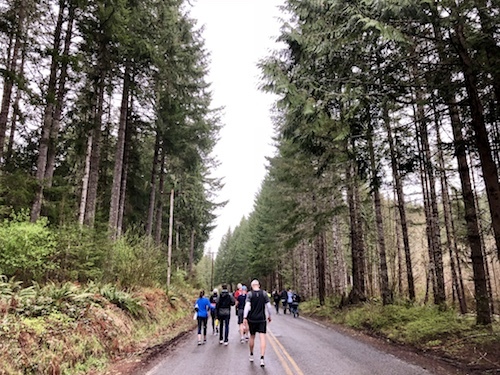 This is the second time I ran the Vernonia Marathon. I love how it’s local. I ran it last year where I got my first BQ but I did not make the cut off to go to Boston. After that I was determined to get a BQ with a good buffer. I had hoped to get it at CIM last December but had a bad race. 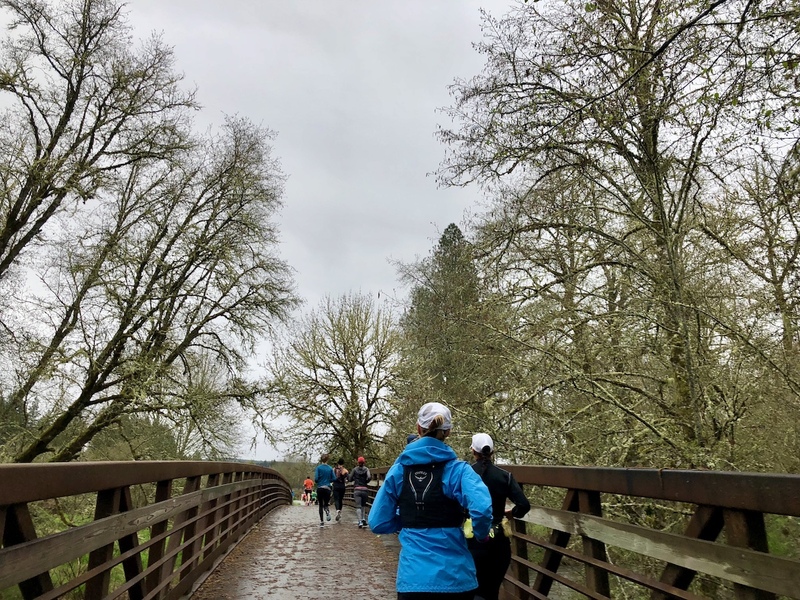 So I decided to run Vernonia again to get that BQ. So happy I did! I woke up around 5 am and had my usual bagel with peanut butter. A little later I had a Health Warrior Chia Bar. The race was not scheduled to start until 8 am but it’s a point to point course so I had to get there early to ride the bus to Vernonia. We left around 6 am where hubby dropped me off at Banks where I picked up my bib at the school. By 6:25 am I was on the bus headed towards Vernonia. We got to the starting area around 7 am. There’s a cafeteria there where we were able to hang out until the start. They had a bathroom inside as well as some outside. Since I was early the line I was in wasn’t bad. I took my race fuel, three scoops of UCAN around 7:25 am. Afterwards, I took my layers off and warmed up with lunges and leg swings. Soon someone with a megaphone was telling us to leave the cafeteria to head to the start line. Walking to the start line, the temperature was in the low 40s and rain was in the forecast. It was great that it wasn’t raining at the start. I’m not even sure when it started raining during the race since I was so focused, but it was coming down at the end. Here’s a starting line pic. Photo credit: ORRC. I had brought an old foil sheet blanket from an old race to stay warm. 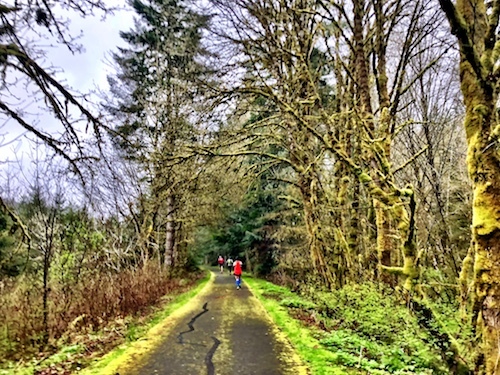 As for the course, it’s beautiful since it runs mostly on the Banks-Vernonia Trail, which I read is Oregon’s first rail to trail and spans 21 miles. 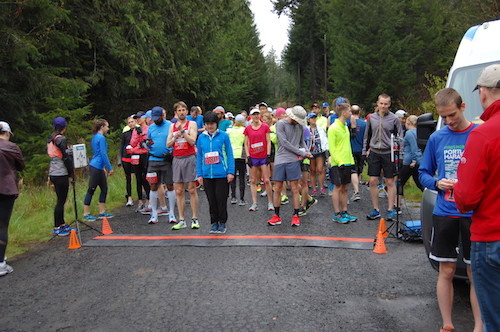 I also like how the course goes around Vernonia Lake starting at around mile 2. Here’s what my Strava chart looked like for the race, which had 581 elevation gain and 1010 ft elevation loss. The race started on time and I was feeling ready. This year I got a pace band from findmymarathon.com. I picked the Conservative Start, which starts slower to settle into race pace, and Even Effort band which gives paces on the uphills and downhills based on effort. With all the elevation changes, I thought it would be a good guide for pacing. Mile 1 – 8:23 = I wanted to start conservatively but that didn’t happen haha. I felt good. This cool bridge was close to mile 2. Mile 2 – 8:16 = Coach recommended the option of going 8:19-8:29 since she liked the even start paces, so I was just a little fast. Mile 3 – 8:25 = Coach recommended going 8:24-8:29, so I was good here. 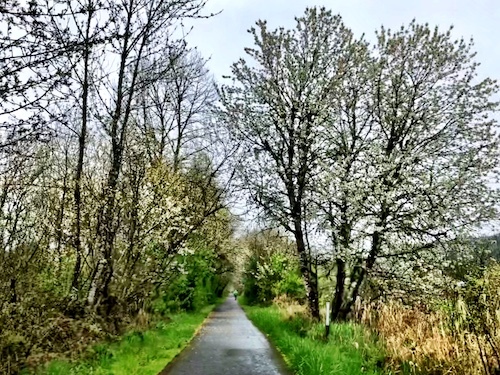 It was nice running around Vernonia Lake. The trees weren’t flowering as much as last year but it was still pretty. Mile 5 – 8:23 My paces were pretty close compared to the band. Some fast, some a tad off but I felt strong. I was hydrating with Nuun every couple of miles. 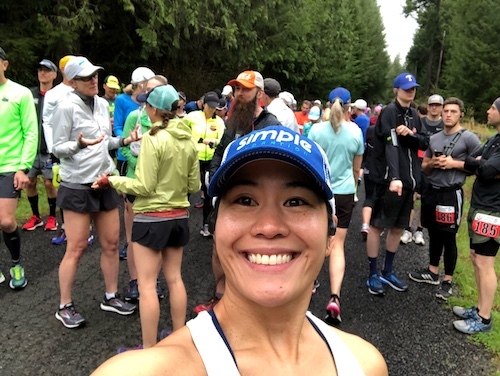 Mile 7 – 8:27 = I was expecting to refill my Simple Hydration bottle with Nuun at the aid station which I thought would be at mile 7, according to the event details, but the aid station ended up being around mile 8. That threw me off a little with my hydration plan. 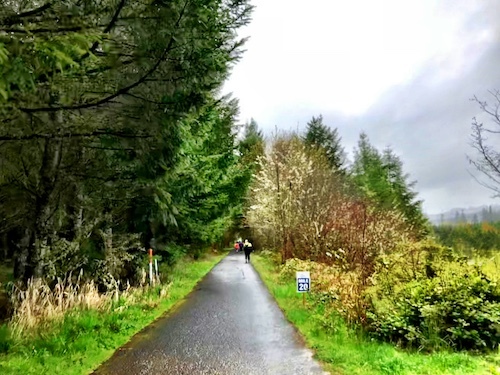 Mile 10 – 8:27 Miles 11-14 is where the big climb in elevation occurred. 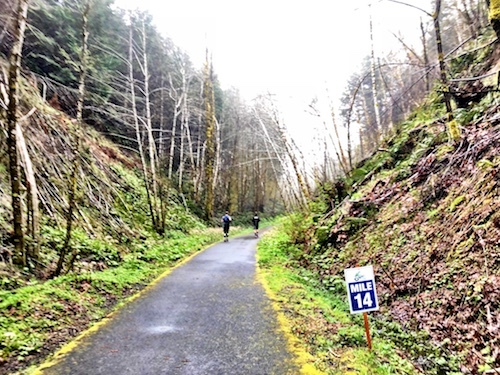 Mile 12 – 8:45 – There’s a steep descent close to the end of mile 12. 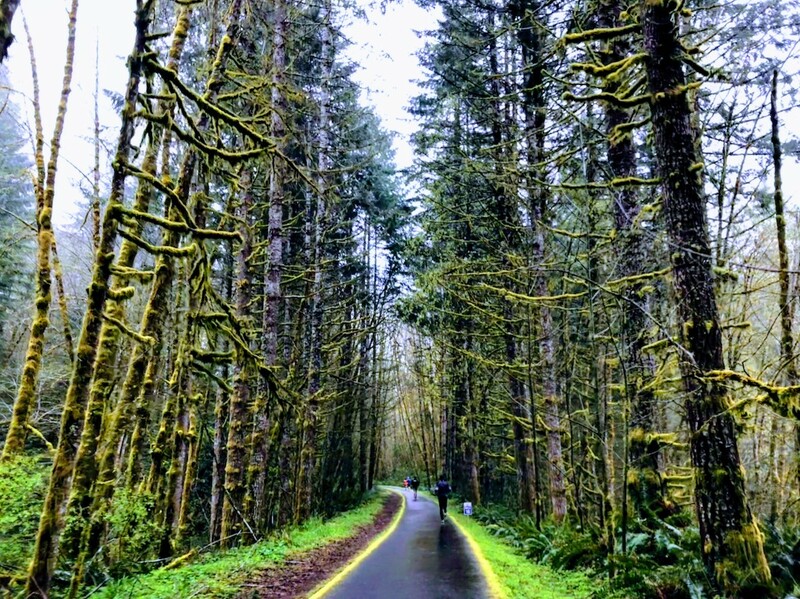 Mile 15 – 8:12 Love this tree lined part right before mile 16. It was pretty much downhill all the way until a little past mile 20. 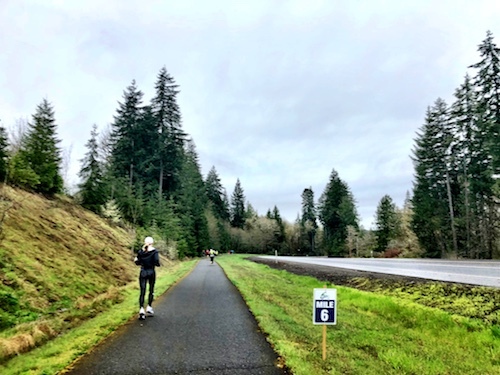 Mile 18 – 8:03 = I took the UCAN gel I made here. This is a nice long bridge where someone was taking pics. I like how they had signs that said, “Smile”, so you knew there was a photographer nearby. From miles 21 until the end it was fairly flat. Mile 21 – 8:17 = I refilled my bottle with water at the aid station at 21.5 mi. 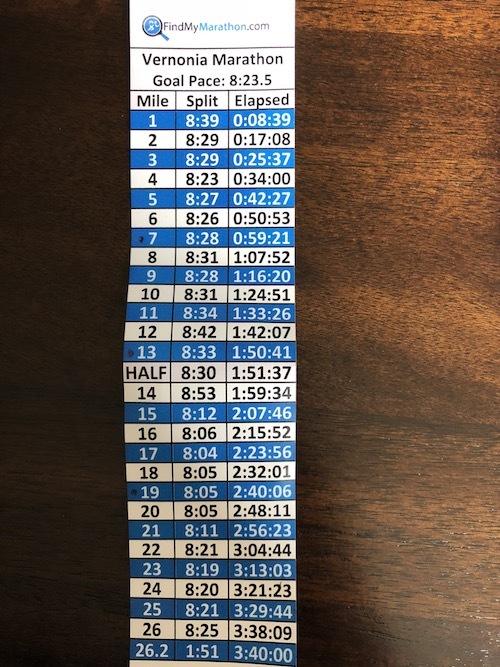 Mile 22 – 8:22 Mile 23 – 8:23 = The band paces were off now since I was running a little slower. My legs were feeling heavier but my music was keeping me going. 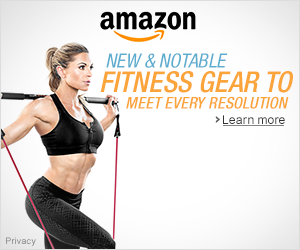 Love my AfterShokz headphones! 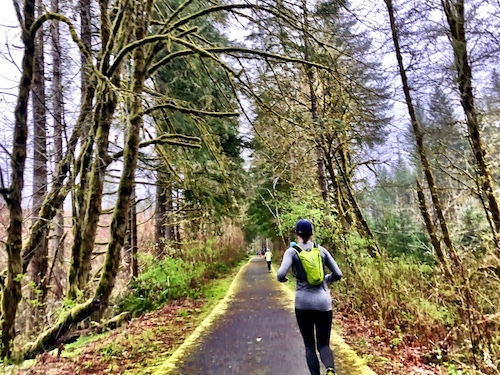 Mile 24 – 8:28 = I was starting to feel my right calf getting tight. Mile 25 – 8:43 = My head was in it but my legs were just not moving as fast as I wanted. My calf was troubling me but I pushed on hoping it wouldn’t ball up. So glad it didn’t. Mile 26 – 8:32 = The end was near and I was still afraid my calf would ball up. I just kept on focusing to keep moving. It was great seeing Mariah and Shannon walking. They cheered me on. That gave me a little boost. 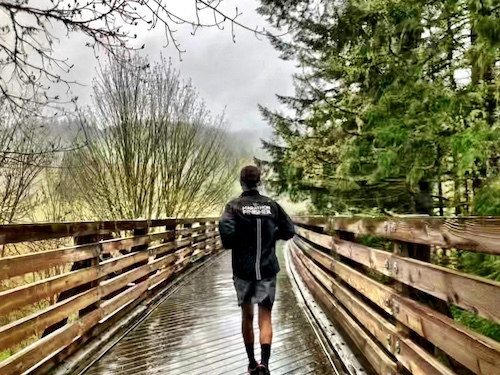 Mile .2 – 7:43 – When I got to the track, I gave it my all knowing every second counted and finished strong. Crossing the finish line I felt and just knew I PR’d! I wasn’t sure what my time was since I didn’t have the timer field on my watch (I had lap pace, distance and pace) but when I looked down at my watch for my time I was ecstatic. My hubby and kiddos were at the finish line and I said to hubby…I did it! I killed it!! 🙂 It’s such an awesome feeling when you smash your goal. My goal for this race was 3:40 and getting 3:39:29 was awesome!! Super happy! I saw fellow Uberthons pacer, Gregg at the finish line haha. 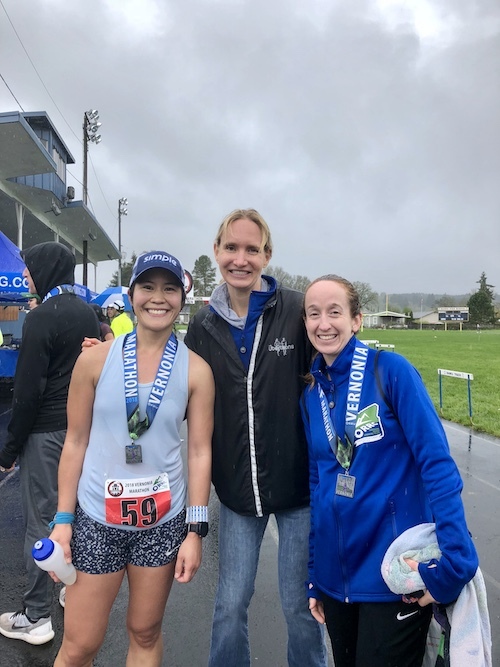 It was great to see Mariah and Shannon again at the finish too. 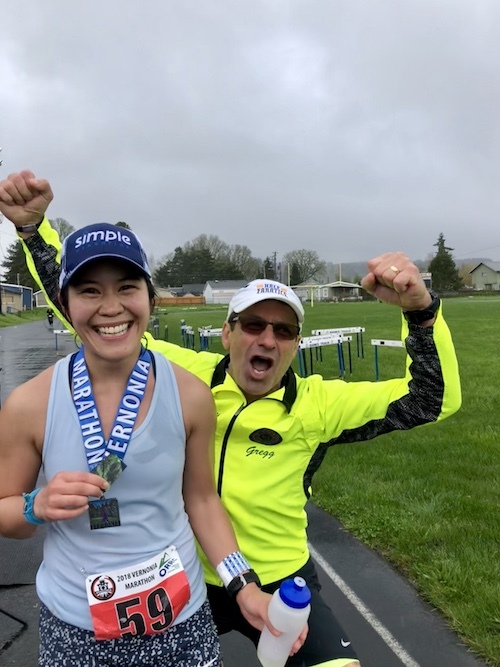 Happy to have my awesome support at the finish line on that rainy day! Haha, they didn’t want to get close since it was raining and I was all wet and gross. But so thankful for the support hubby and the kiddos have given me! There was water, Gatorade, juice and bars at the finish. Inside the school, there was baked potatoes, rolls and soup. Finishers also received Fitsok socks. According to the results I got 2nd in age group, but they called me up as getting first since I think the person ahead of me won the Masters award. They also had a raffle and I won a pie 🙂 . Here’s the nice medal. Here’s the finisher certificate from their results page. I also was 12 of 70 in Gender, and 43 of 170 in Finishers. I love this race! It’s definitely a PR course. I PR’d this time by 3 min and 10 sec. Huge thanks to Coach Dawn who’s helped me get to where I am as a faster runner! This training cycle went fantastically. The only thing I didn’t like about this race was the aid station mix up. I thought there’d be an aid station at mile 7 but there wasn’t one. But the volunteers were great and supportive like last time. They helped fill my bottle with pitchers ready. Although it rained, it didn’t bother me during the race. I was cold afterwards and was looking forward to a hot shower when I got home. But I’m so excited to have qualified for Boston!!! This is huge for me since it was a dream. I’ve come so far, from hating running long distance to loving it haha. My first marathon time in 2015 was 4:26:33 and now it’s 3:39:29. I have earned my spot and get to be a part of the Boston Marathon next year. So inspiring seeing all the Boston posts this week. Hopefully the weather is way better next year. Dreams do come true. Just gotta keep at it and never give up! 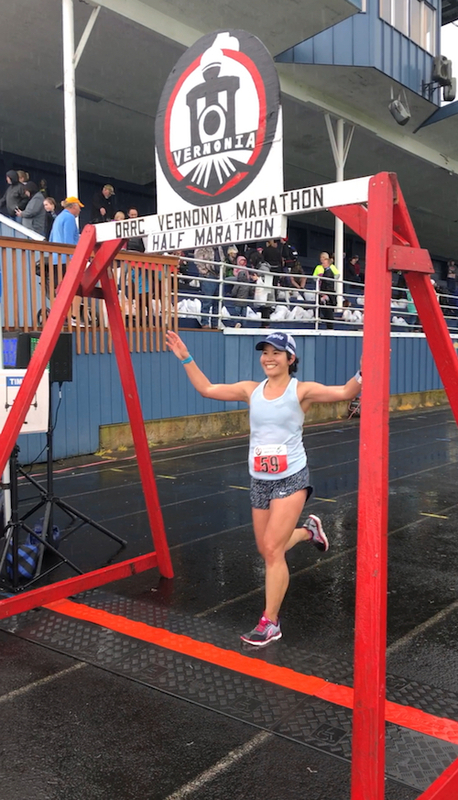 My finish line video courtesy of hubby. Congratulations Sherry! 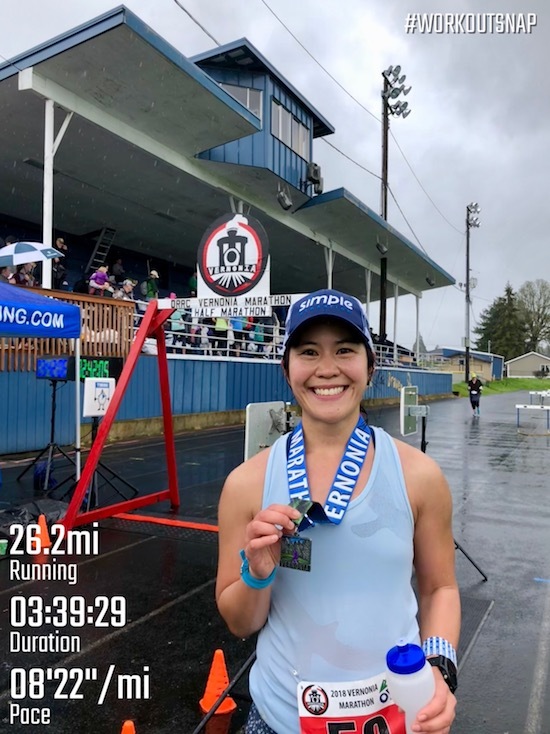 You’ve been running and training so well, I’m so happy you came back to throw down a BQ PR! That looks like a gorgeous course. Did you take all those pics while you raced? That ascent/descent looks very formidable to this flatlander. Awesome job! Congrats!! I love that this was a small race so you could just focus and do your thing. I also like the descent for the back half of the race. You did amazing!!! BQ, baby! Thanks Wendy! Yes, small races are so nice. Hurrah!!! You ran such a great race! Congratulations on the BQ/PR! Cant wait to follow you next year Boston 2019 😁 I probably said this last year, but the course is beautiful! You did amazing!! Congrats again on the BQ! yay!! Huge congrats on your are and PR. I have followed you on Instagram, but never realized you wrote a blog too…..oops! Earning a BQ is huge, but then missing the cut is heartbreaking. So glad you have a big cushion for 2019. Hope to see you there! Thanks Pam! Hope to see you there! Congrats Sherry on the BQ and the pie.I hope we run in to each other at the Boston Marathon expo! Thanks Dale! The pie was good 🙂 . Yes, hope to see you there next year! 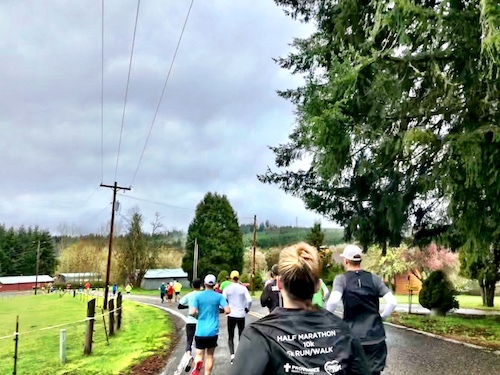 Sherry, you had a fantastic training cycle and your performance at Vernonia was just icing on that cake. I’m so happy you smashed your goal. It looks like a beautiful course to enjoy as well. Congratulations! 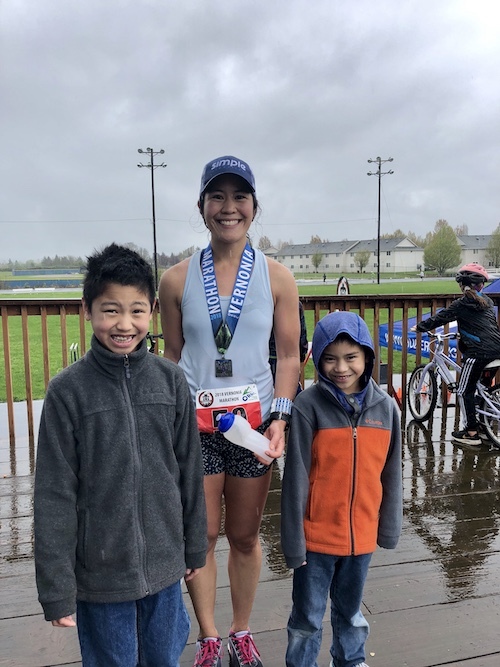 Congratulations on your BQ – you had a fantastic race and even though it got tougher near the end you finished with a smile! I really enjoyed following your training each week! Thanks so much Janelle! It was great that all the hard work paid off.